We predict and analyze provincial-level healthy life expectancy for 31 provinces of China in 2015. Using data from a wide range of countries, we construct a predictive regression model based on socioeconomic variables such as GDP per capita, health and education expenditures, and the number of hospital beds. We find substantial regional health disparities, with healthy life expectancy varying by up to 10 years between different provinces for both men and women. Although health and longevity have improved rapidly in China in recent decades, there remain significant inequalities in health outcomes between different regions. In our paper Li et al. (2017), we study healthy life expectancy (HLE) at the province level to understand and quantify these health disparities. HLE is a similar concept to life expectancy (LE), but focuses on how long an individual can expect to live in good health. It is an important and widely used measure of population health as it takes both the quality and quantity of life into account. By studying how HLE varies across different Chinese provinces, we provide important new results for the design of public policies and the development of private-market banking and insurance products. HLE is typically computed using information on age-specific prevalence rates of ill-health and age-specific mortality rates. Because this data is not publicly available for China there is little previous research on regional disparities in HLE across China. The new idea of our paper is to “borrow” information on the links between HLE, LE, and socioeconomics from other countries to construct estimates of provincial-level HLE for Chinese provinces. Our approach is motivated by the observation that provinces in China can be seen as separate countries in terms of their economic development. Several studies have found a strong relationship between LE, HLE, and several socioeconomic variables. For example, Banister and Hill (2004) found that per capita consumption levels, literacy rates, the number of doctors, and health and education spending explain LE levels in China. Other studies, such as Law and Yip (2003), have shown that LE levels themselves are highly correlated with HLE—a link that is not surprising given that LE is, by definition, the sum of HLE and the expected number of years spent in ill-health. Building on these earlier findings, we developed a multiple regression model for the ratio of HLE to LE using GDP per capita, public health spending (as a percentage of GDP), public education spending (as a percentage of GDP), and the number of hospital beds and physicians (per 1,000 population) as explanatory variables. We obtained socioeconomic variables from the World Bank and the OECD and use HLE and LE figures from the 2013 Global Burden of Diseases Study. Because several studies found that the mortality experience of Asian populations differs substantially from that of other ethnic groups, we also included an East Asia dummy variable into the model. We tested the predictive ability of the new model using data from the 2013 Global Burden of Diseases Study and using data for Taiwan, a region which shares many cultural and historical ties with mainland China. The results show that our models produce reliable out-of-sample HLE predictions. Thus, we applied the model using LE and socioeconomic data for China’s 31 provinces in the year 2015 to generate province-level HLE predictions and 95% prediction intervals. We compare our results with HLEs for other countries to highlight the extent of regional variation observed in HLEs across China. The darker-colored regions in Figure 1 represent provinces with higher levels of HLE, while the lighter shades correspond to provinces with lower HLEs. We match each province to the country with the closest published HLE estimate in 2015. For example, Beijing’s predicted male HLE of 70.53 years is very close to that of Italy, and Shanghai’s HLE of 69.54 years is comparable to Austria. Overall, the highest HLEs found in China match those of developed countries such as Italy, Austria, or Canada. At the other end of the spectrum, low-ranking provinces such as Yunnan and Tibet have HLEs comparable to those found in developing countries such as Egypt and Mauritania. The map also shows that there is a notable geographic trend. 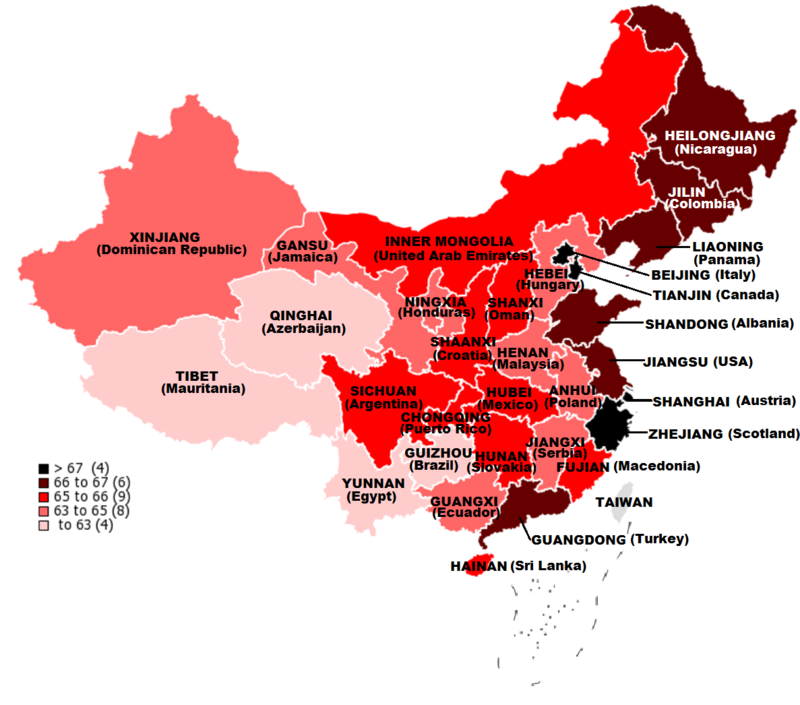 Provinces on China’s east coast, such as Beijing, Shanghai, and Zhejiang tend to have the highest HLEs. As we move across towards the middle regions, provinces register mid-range HLE values, while the lowest-ranking provinces are found in western China. 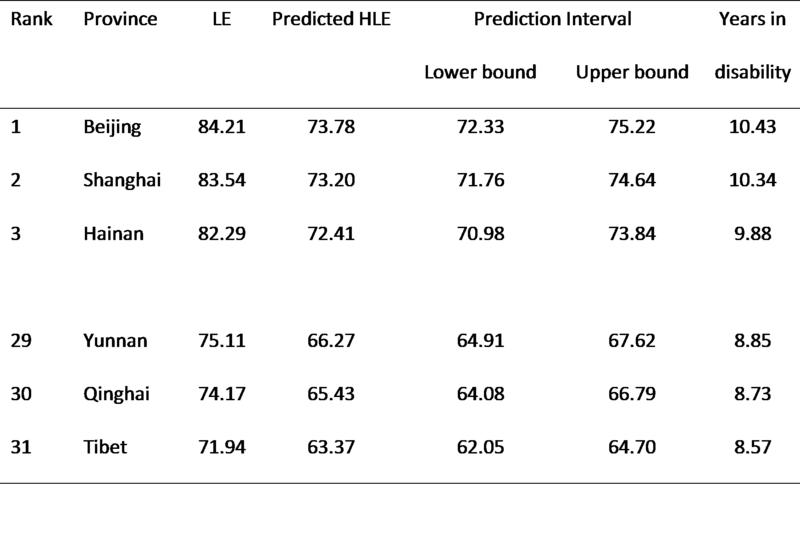 Table 1 shows the top 3 and bottom 3 provinces in terms of predicted male HLE in 2015. Beijing ranks highest, with a HLE of 70.53 years and a 95% prediction interval of 68.54—72.52 years. Taking the difference between LE and HLE, we conclude that, on average, males in Beijing spend 8.5 years in disability or ill health. Tianjin and Shanghai also rank among China’s top three provinces in terms of HLE, with estimated HLEs of 69.63 and 69.54 years, respectively. Yunnan has the lowest male HLE of all provinces in China, predicted to be only 60.44 years—more than ten years shorter than Beijing. 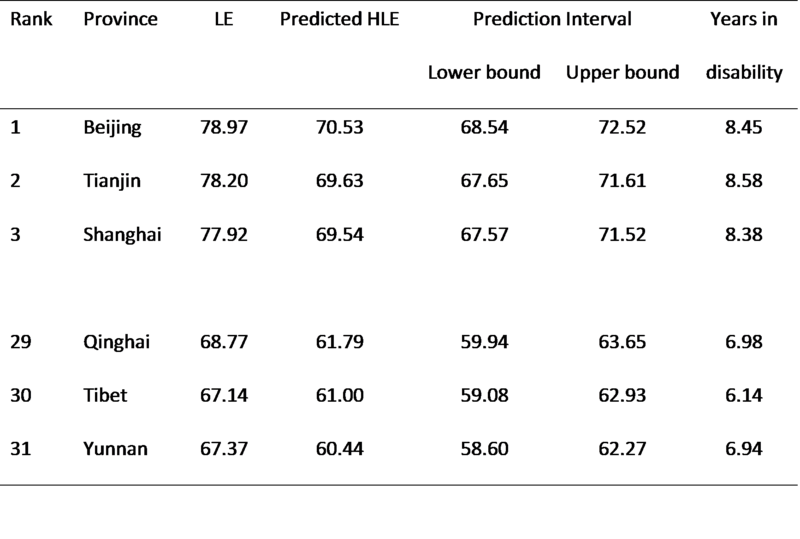 This shows that, despite the rapid improvements in HLE across China as a whole in recent decades, there still remain significant regional variations between the affluent provinces and those with lower levels of socioeconomic development (see Hanewald et al. (2017) for a comparison of health and mortality trends in urban and rural China). The map of female HLE shown in Figure 2 is largely similar to the map for males. Once again, darker colors are used to indicate provinces with higher HLEs. 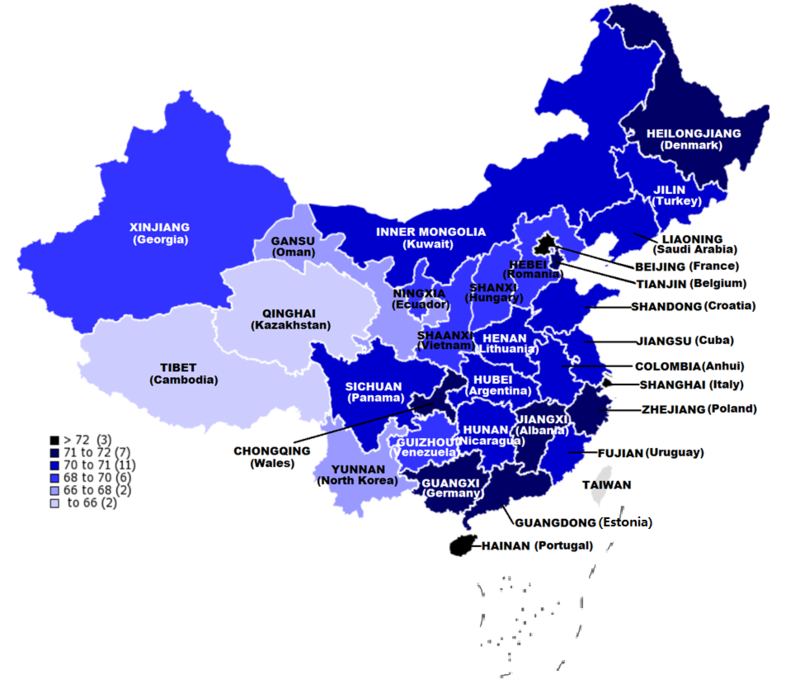 Provinces located in eastern China again have the highest HLEs, with levels comparable to those of advanced developing countries such as France (Beijing), Italy (Shanghai), Denmark (Heilongjiang), and Belgium (Tianjin). We find that the provinces with relatively low female HLEs have values similar to less developed countries in Asia. For example, Tibet’s 63.37 years matches the HLE for Cambodia, while Yunnan’s estimated HLE of 66.27 years is comparable to that of North Korea. The top 3 and bottom 3 provinces by predicted female HLE in 2015 are shown in Table 2. Once again, Beijing leads the list, with a predicted HLE of 73.78 years and a 95% prediction interval of 72.33— 75.22 years. Female LE in Beijing is 84.21 years, about 5.25 years longer than the province’s male LE. This difference can be broken down into 3.25 “healthy” years and 2 “unhealthy” years. This illustrates a general finding in our study: although women tend to enjoy higher LEs and HLEs, they also spend a longer period in disability on average than men. Shanghai and Hainan rank second and third according to predicted female HLE, while Tibet, Qinghai, and Yunnan once again have the three shortest HLEs, albeit in a different order than in the male rankings. As was the case for men, the range between the highest HLE (Beijing, 73.78 years) and the lowest (Tibet, 63.37 years) is more than an entire decade, illustrating again the substantial health disparities between different regions in China. The results provided in our new study Li et al. (2017) show that healthy life expectancy (HLE) varies by up to 10 years between different provinces of China for both men and women. These large regional health disparities mirror the variations in regional development in China: We find large and significant positive correlations between HLE and GDP per capita for both males and females. Policies aimed at reducing regional economic inequality in China are therefore likely to also reduce the disparities in HLE across China’s provinces. Our findings have important implications for the design of aged care and retirement policies in China. In the context of increasing life expectancies, ageing populations, and rising dependency ratios, governments around the world try to encourage higher labor force participation at older ages. The Chinese government has proposed to gradually increase the retirement age to 65 years for both men and women from the current levels of 60 years for males and 50–55 years for females. Our results show that male HLE is less than 65 years in 12 provinces, which suggests that health limitations are likely to prevent a large percentage of men in these provinces from being able to work until age 65.